Here's what you can do when you get rid of analog TV broadcasts. Repurpose bandwidth. In Japan 900 MHz became available after TV went all digital. The original plan, as I was aware, was to auction it to the highest bidder. That would have been a disaster for SBM. Either they'd have to really shell out the yen or continue to be the only one of the Big Three without a low-frequency allocation. Low frequencies are attenuated less and penetrate deeper underground and in mountainous areas. However, it turns out that the MIC gave it away based on need. After evaluating the state of network congestion of each of Japan's four carriers, who all applied for it, SBM was awarded the band. This will help with their LTE plans. [Update: SGM deployed 900 MHz for 3G.] Emobile would have also liked to have had it, as they not only have no low frequency band, but also have an exotic frequency not used by other carriers. It will be interesting to see how this effects Emobile's LTE plans. It doesn't even overlap with AWS used by US T-Mobile. 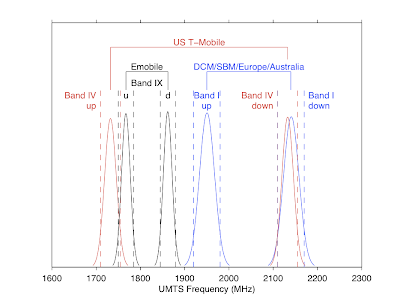 Below is how the higher-frequency bands are distributed between Japanese carriers. It becomes obvious why US T-Mobile handsets work with Docomo. The overlap is just an idealized IMAGE. The curves are just a gaussian fit to a uniformly distributed histogram of random numbers between the ranges of each band's up and downlink. I have no idea how power is actually distributed within the spectrum. Sources: IT Media and Sven. 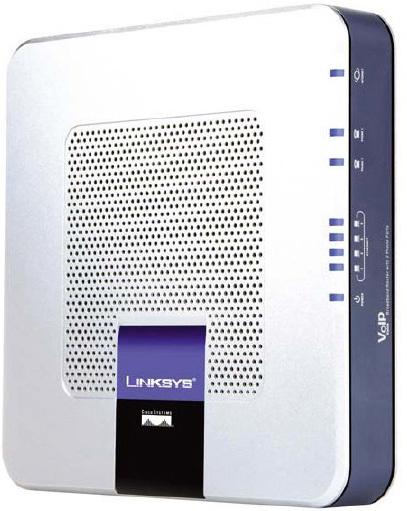 This post will describe the procedure for unlocking a Linksys RTP300 ATA running Vonage firmware version 12.0.1-r100920-3.4.2. There are currently no known exploits for this version or the wifi version (WRTP54G). Vonage pushed this version sometime in early 2011, and the only reasonable route is convincing Vonage to roll back the firmware to 5.01.04, which I successfully did and am now using this same hardware with a different VoIP provider, CallWithUs. I've been using this same equipment since 11/2005, during which it has been running nearly continuously and only been shut off when being transported between the US and Japan (and occasionally Europe). That works out to well over 55,000 hours of nearly continuous uptime. Your phone adapter will never work with Vonage again. Ever. You run the risk of bricking your ATA and it will never work again. Ever (at least without special equipment and engineering knowledge). You should proceed at your own risk - we aren't responsible if your break your device. I am not to credit for any of this. Many other people figured out the means for unlocking and modifying the necessary firmware. This guide is copied primarily from here. All I've done is update the links to some of the necessary files, add some screenshots, and describe what to do for ATAs with the latest firmware. MS Windows (virtual install is acceptable). 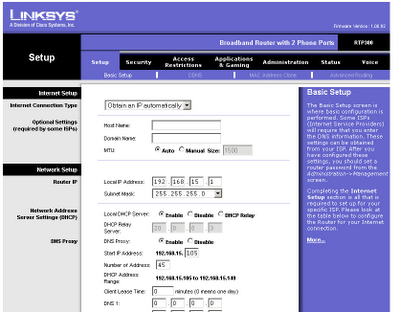 The goal of this procedure is to flash the non-branded Cisco firmware to the RTP300. 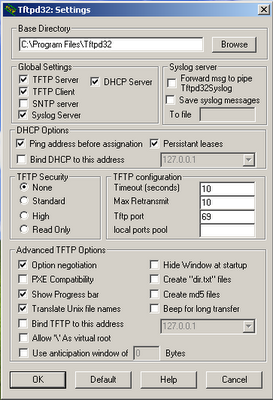 This allows manual SIP configuration so the ATA can be used with any provider. 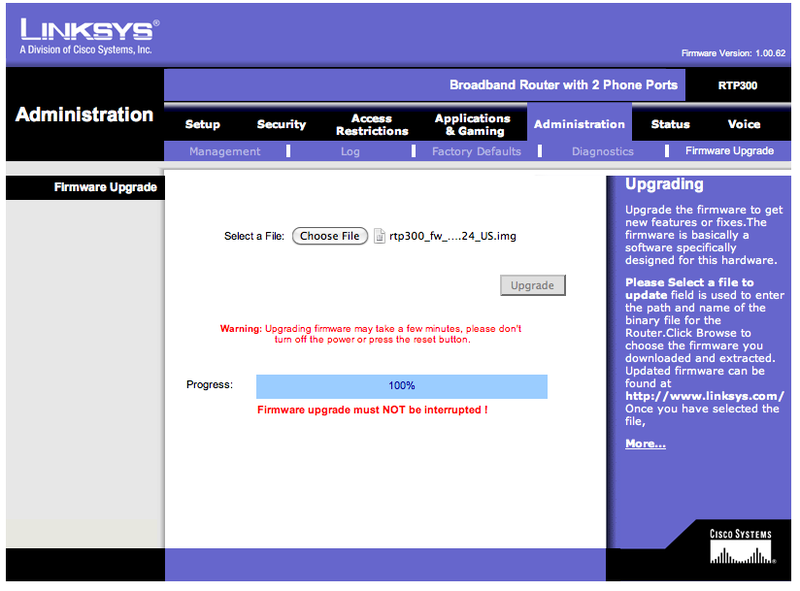 If running v. 12.0.1-r100920-3.4.2, convince Vonage to roll back your firmware to v 5.01.04. Use CYT to reset the firmware upgrade credentials (This is separate from the standard administrator password used to configure the device). 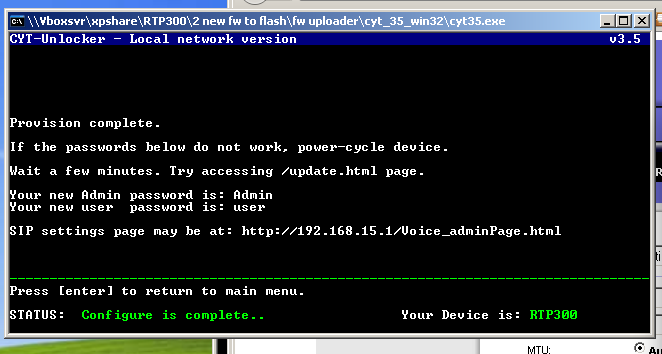 Download from Cisco firmware version 3.1.24 for the RTP300. This will be the final version you flash. Use a HEX editor to make a slight modification to the firmware. Login to firmware admin page of the ATA with credentials set by CYT and flash the firmware modified with the hex editor. If your firmware is v. 12.0.1-r100920-3.4.2 (as pictured below) or higher, with a black and orange skin with Vonage branding, your have the new firmware. You'll have to call vonage and ask them to roll back the firmware on your device, which they can only do if your device is actively connected to their network (i.e, you are a current customer). Once rolled back, DISCONNECT YOUR ATA FROM THE INTERNET BECAUSE VONAGE SERVERS WILL AUTOMATICALLY UPDATE IT BACK TO THE NEW FIRMWARE. Honestly, I actually can't believe this worked. I decided to wait until the Tier 1 service reps were at work, e.g., 9 to 5 on the East Coast. Then I called and said that I recently noticed that I had a new firmware version, and asked if they could roll it back to the old version. I used the excuse that I didn't like the new version (which is true). They said they only had "version 11" available and they could push that. Apparently their internal version numbering is inconsistent with that what is displayed because after they pushed "v 11", my ATA showed v. 5.01.04. Delete the original von10062.bin file in the extracted von10062 folder. Copy it to the extracted von10062 folder, replacing the original. Part 5. Download RTP300 firmware version 3.1.24 from the Cisco Site. There is only one hardware revision (version 1.0). Unzip the file and confirm the MD5 sum (a430df5109cefc8daaa8ef97720fb3b1) of the file rtp300_fw_3.1.24_US.img. When finished check the MD5 sum. If it is not b15b248145a48e745afd5003c88eee17, you did something wrong. 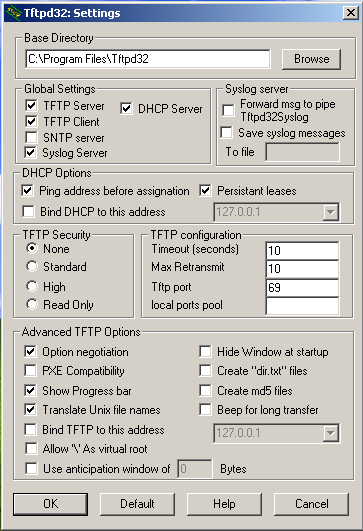 Run TFTP32, and Click settings, then setup the base directory. Use the directory into which you installed the program (ex. C:\Program Files\TFTP32), and make sure the extracted files from the ZIP (Step 1, part 3) are in this directory. Change security to none, and set the timeout and max retransmit to 10 and then hit OK.
Part 1. 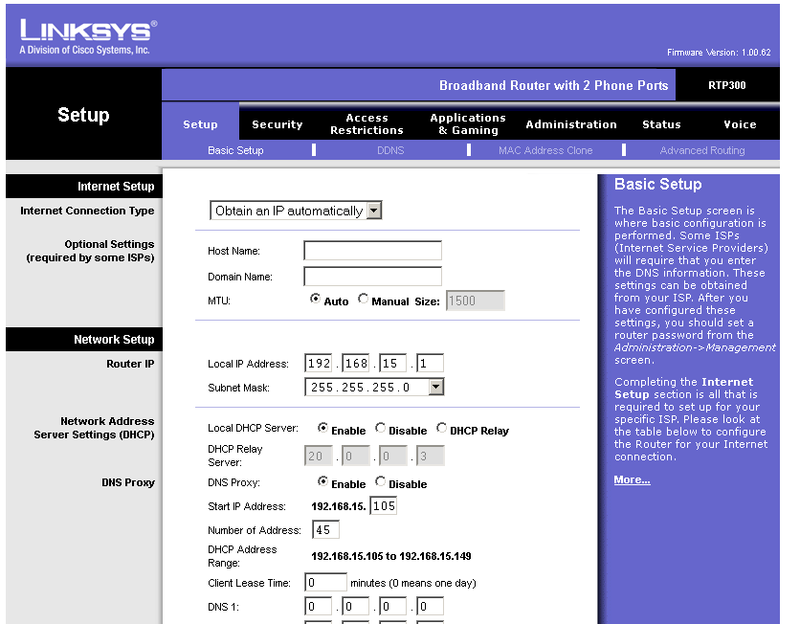 Disconnect from the internet and connect directly to the RTP300, making sure the device is also not connected to the internet (i.e,. pull the Ethernet cord out of the WAN port). Also make sure to disable any Anti-Virus and firewall programs that may be running. If running Windows as a virtual machine, you'll need to bridge the guest and host networks, the settings should be fairly obvious. Part 2. Use a paperclip to reset the ATA by pressing for 10 to 15 seconds. (Note, this is not necessary if you edit the "rf" file to reflect your client IP address and make appropriate changes below.) Login to 192.168.15.1 with user/pass of admin/admin and go to Administration/Ping. 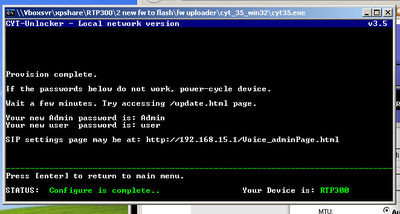 Make sure TFTP32 is running. After a few seconds you should see some information in the output box. Scroll down to the last line and look for CONSOLE_STATE unlocked. Part 1. Unplug the RTP300 and leave off for at least 5 seconds. Part 2. Login to 192.168.15.1 with admin/admin and go to Administration/Ping. Make sure TFTP32 is running. Part 1. Login to 192.168.15.1 using admin/admin and leave this window open. Ensure that firmware 1.00.62 has loaded successfully. Part 2. Open cyt35.exe. Select Option 1. Wait for CYT to provision the RTP300. The output for a successful provision will be fairly obvious. This process will take 1-2 minutes. Path at top indicates this is running in VirtualBox. Part 3. Open a new window and head over to 192.168.15.1/update.html. Login with Admin/Admin or admin/admin. Using CYT makes this window accessible. Part 5. Wait a few minutes and the device will reset itself and take you back to the login page. Part 6. Login to 192.168.15.1 with admin/admin. Ensure that the firmware is 3.1.24. Part 7. Cancel your Vonage service and configure SIP for new VoIP provider. 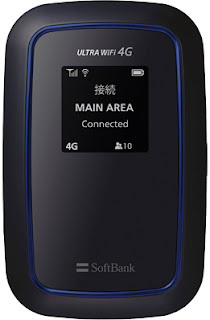 According to a press release, if you sign up for a Softbank "4G" unlimited flat (4Gデータし放題フラット) plan by 4/30/2012, an up to ¥2,000 discount will be applied indefinitely. 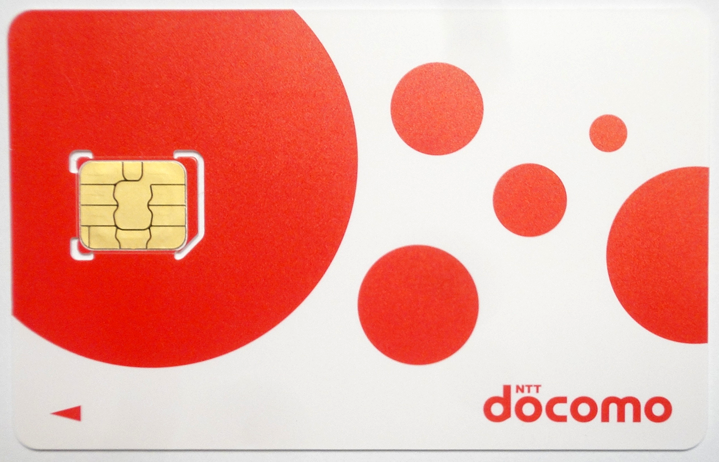 NTT Docomo is also offering a similar discount to customers who sign up for it's Xi LTE service by May, but unlike SBM, monthly service fees will increase to the standard ¥5,985, which is also the standard price of SBM "4G" unlimited flat. However, unlike Xi, SBM's "4G" service is currently available only as a mobile wifi router. No phones are available. Compatible phones will certainly be released, but don't expect any until after this current campaign ends. The standard discount is ¥1,000. Owners of SBM smartphones and tablets (excluding "X" series phones) may apply for an additional ¥1,000 discount, if they have one of the following data plans. HOWEVER, from the end of October, similar to Xi, Softbank "4G" unlimited becomes UNLIMTED*: After 5 GB of usage, speed will be throttled to 128 kbps. Additional bandwidth will be available at ¥2,625 per each additional 2 GB. NTT Docomo will implement a similar plan with Xi, but the throttling is to begin from 7 GB. 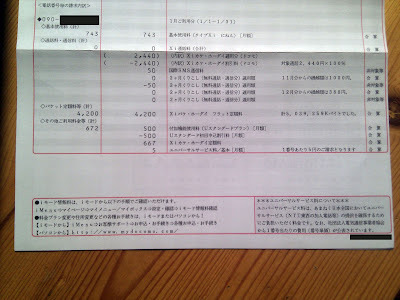 Because NTT Docomo refuses to guarantee that unlocked phones from other carriers will work properly with Xi, here is the relevant portion of my January invoice that confirms there are no billing irregularities using the phone of my choice with a NTT Docomo Xi (LTE "4G") SIM card and contract. My feeling is that their refusal to simply say, "yeah, it should work - no problem," is because it absolves them of any responsibility if something did go wrong, which is, as far as I can tell, technically impossible. It also introduces enough doubt and concern to perhaps prompt someone to buy a new phone from Docomo. NOTE: Using a Xi SIM in a regular 3G handset will result in no increase in speed. Even though Xi data is not unlimited (7 GB cap after which speed is throttled to 128 kbps), it is significantly better for non-docomo branded phones than a FOMA 3G contract. 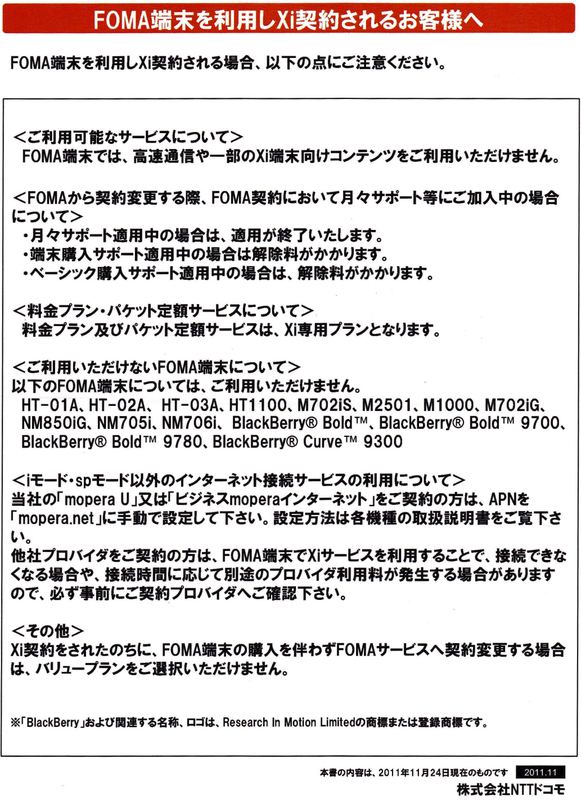 This is because the standard FOMA data APNs are filtered by IMEI number. Attempting to use any non-Docomo phone, or anything other than the two phones with IMEIs currently in Docomo's database, WILL result in no data connection to the (relatively) "inexpensive" APNs. The only way to open a working data connection with a FOMA SIM card is to set one of the APNs that add prohibitively expensive additional fees, either per packet charges or a tethering fee. Docomo's treating of tethering with Xi is very reasonable. They don't add any extra charges and allow tethering. Another potential advantage of Xi is the option for 24/7 free calling to other Docomo subscribers. However, this quickly becomes a pitfall if you often call non-Docomo subscribers because Xi voice plans contain zero free included minutes and no possibility of discounts to non-Docomo numbers. You can confirm if you are calling a Docomo number before the call connects. The standard beeping while the call is being placed (i.e., beep beep beep x3) is replaced by a voice saying "Docomo". While the price for data is currently very good, this is a campaign price. From May 2012, the price will increase to the standard ¥5985, so I haven't listed price as an advantage. There shouldn't be any real issues doing this, though I haven't personally started a new contract. I simply changed mine from FOMA to Xi. It should be as simple as walking in and asking for a new contract for Xi. There are both regular and micro SIMs available. If you run into trouble, ask to speak to someone else or go to another store. None of the J carriers make much of an attempt to educate store staff members on practices that are somewhat out of the ordinary. The APN is mopera.net. Other details here. 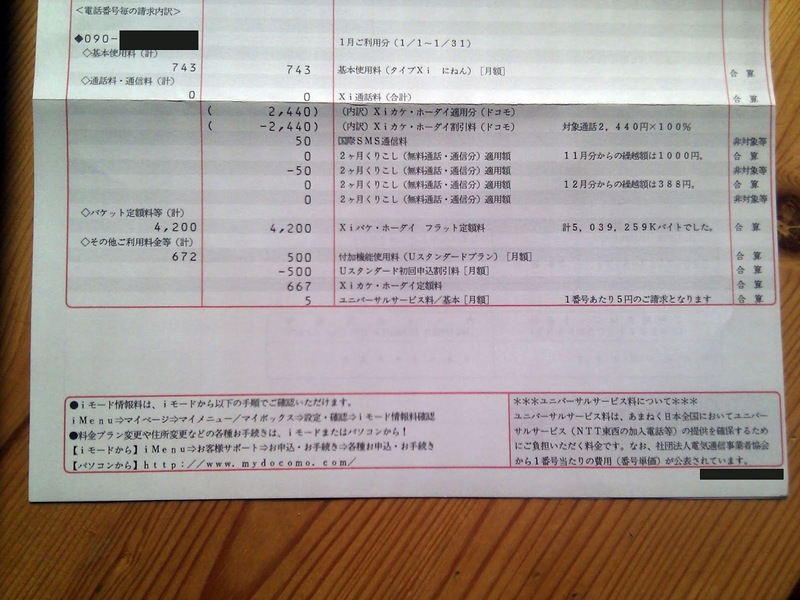 For some reason, Japanese telcos feel compelled to make invoices overly complicated. It appears to be an attempt to show the customer how good a deal they are getting with unlimited contracts by listing many (often large) numbers and then subtracting them out. The irony is that, compared to the rest of the world, Japanese contacts are expensive. With tax, this works out to ¥4,410 for 7 GB of data, of which I used 4.8 GB, and ¥1,480 for unlimited calls to Docomo subscribers. 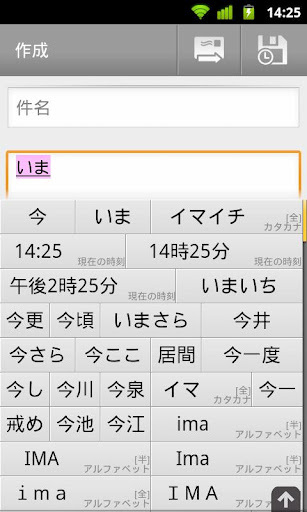 I made no calls to non-Docomo people using my cellular plan. Instead I used SIP, which provides much better rates to Japanese mobiles than any J carrier. 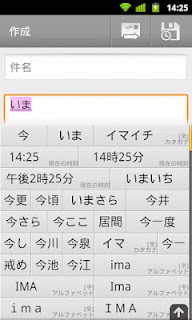 Without the discount, Xi calls are billed at ¥21/30 seconds. The ¥2,440 amount of calls indicates I only used 58 minutes, which is not a lot but definitely enough to be worth paying the extra ¥700 for Talk 24. The international SMS charges, which are the result of user error (replying to an SMS without using the Google Voice app - d'uh! ), were offset by a credit carried over from previous months where I didn't use all of my included FOMA voice allotment. Because Xi voice plans include no allotment, this credit will no longer be available to me. Main article is here. 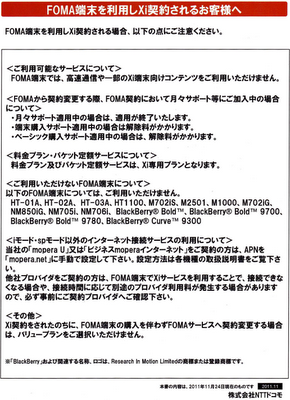 We have confirmation that it is indeed possible to purchase a FOMA handset and use it with a Xi contract while receiving monthly handset subsidies (i.e., 月々サポート). The trick is to immediately contract for Xi service upon purchase and NEVER have a FOMA contract. Canceling a FOMA contract cancels subsidies, period. Not being locked into a proprietary application or hardware - necessary SIP credentials must be provided. Fine print: All prices are final, there are no bogus fees and unfees. Period. Only SIP devices that have already been created can be connected to sip.callwithus.com to make calls. Please ensure you only use devices approved by you (Please do not try and connect using two tin cans and a piece of string as we do not yet support this, but we may support this in the future, the work is in progress and preliminary results are positive). Callwithus.com monthly subscription charge of $0 must be paid in advance and does not include tax of $0 which also must be paid in advance. You will be billed an activation fee of $0 plus tax and this must be paid in advance. Calls made incur tax at the rate of 0% each month and must be paid in advance. On cancellation of the service you will be charged a one time disconnection charge of $0. Additional features will be billed at the additional rate of $0 per call. All **YOUR** rights reserved. You can charge your account with paypal or google checkout. As long as you have a positive balance, you can receive incoming calls and place calls for free to other CallWithUs subscribers. Email notifications are an option for low account balance level warnings. There is no option to autocharge your account, so there is not way these guys can make unauthorized charges to your credit card. Either I missed it or an auto charge function was recently added. In addition, maximum per minute rate, maximum call time, and maximum total call price can be set. All options can be added on ala carte, except for 911, which is not available. Incoming caller ID lookup (CNAM) can be added for 0.6 cents (yes, about half a cent) per incoming call. Voicemail can be added for $1/month. Direct inward dialing (DID) is $5.49/month, which provides you with a working phone number and (typically) 3000 incoming free minutes. A VPN can be added for $30/year (If your mobile carrier blocks VoIP). Different tariff rates may be selected for outgoing calls, e.g., standard, premium, and PSTN (in order of increasing price and quality). I use the premium tariff. They are very security conscious. If your IP doesn't resolve to the general location of the billing address of your card (as registered on paypal or google checkout), they will not accept your payment. (You will have to provide them a scan of your ID to prove identity if you use a US credit card from Japan.) They will also not immediately credit payments from new accounts. Instead they'll hold the money for a day or so, which gives a reasonable amount of time for any fraud to be detected by the owner of a hacked account. Instead of paying for voicemail, I point my US DID to my US GV number and use google's free alternative, which includes audio transcription (i.e., "visual voicemail"). A US IP Address is required to sign up for GV, but once your are signed up, you can use GV from outside the US. I use the android GV app for checking voicemail and sending text messages. GV is not VoIP, so you don't use the GV app to make phone calls with CallWithUs. 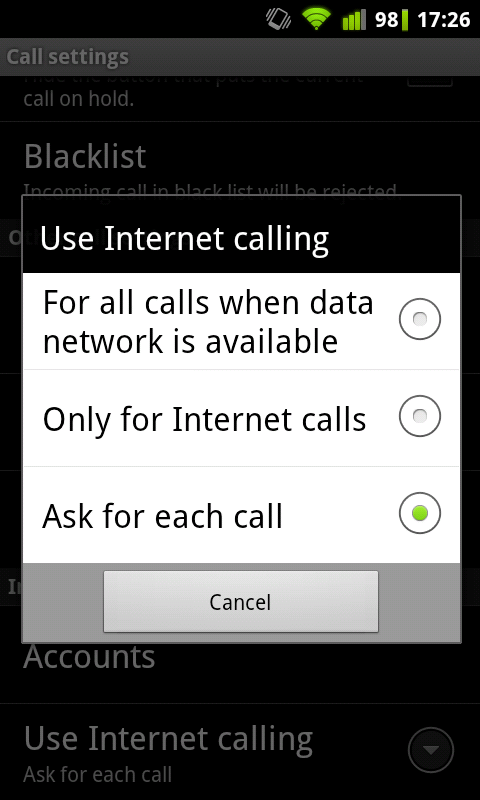 A SIP client is required to make calls from your Android mobile. CallWithUs works with Android's built-in SIP client and with other clients such as sipdroid or csipsimple, though quality with csipsimple is markedly lower. I have no problems making and receiving calls over 3G with my Nexus One and Xi SIM. The only issue is with making (free) SIP to SIP calls with other CallWithUs subscribers when using wifi and because of the lack of STUN support in the built-in client causes loss of incoming voice. Other clients have STUN support, and I have confirmed that it works. A future post will describe in more detail using this with Android. I've also tested this with softphones on my notebook, and my Linksys RTP300 ATA. Configuration is pretty easy. The only issue I've had so far is NAT traversal from the ATA. The STUN settings don't have an effect, and my NTT VDSL modem/router is such an utter piece of crap that the DMZ settings don't work. Because it was a vonage ATA, I had to 1) call vonage and convince them to roll back the firmware to a version with a vulnerability that allows me to then 2) unlock the device and 3) flash modified firmware. A future post will describe setting up the ATA. I set up this comparison to be well above my actual usage. It is based on 500 outgoing minutes per month to US numbers, 60 minutes to Japanese landlines, 180 minutes to Japanese mobile numbers and 60 minutes to Japanese "050" IP phones. (In Japan, VoIP is referred to as an IP phone.) Additionally, I added 5 incoming calls per day with caller ID lookup (which added less than a dollar to the CallWithUs charges). Callcentric is the other provider I considered. They also rank similarly high, and I confirmed that they can process J credit cards. 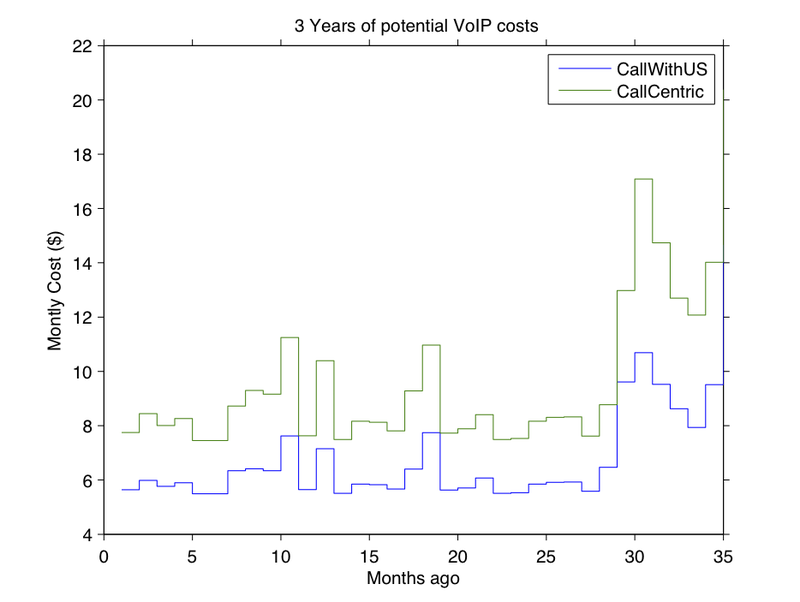 Callcentric will be a little more user friendly but have less configuration options and cost more money. Vonage prices are based on what I was charged monthly for the "Vonage World" plan. Your actual price may vary based on local tax rates. ** After 3000 minutes, incoming are billed at 1.5 cents per minute. *** VPN is only necessary if your mobile carriers block VoIP connections. I was a satisfied Vonage customer for over seven years. I rarely, if ever, had any service issues. I just don't talk enough to people in the US to justify the cost of my plan. Part of the reason I stayed with Vonage as long as I did was because the service was good and they are a known quantity. The other reason is that google has yet to be successful in lowering the page rank of all the content farm spam sites that clutter the results for VoIP searches. And there are a lot! One of the most frustrating things I've done lately is try and create a short list of reputable alternate VoIP providers. Inability to pay with my foreign credit card meaning I have to send money to the US periodically. Unavoidable charges for state sales tax, 911 etc. that add up to an additional $10. How much would I have saved if I left Vonage sooner? This is really a moot point. Paying at least $35/month for a very reliable US phone number in Japan is worth it to me. However, had I switched to CallWithUs three years ago, how much would I have saved? About $1,000 dollars. Callcentric would have saved me about $900. 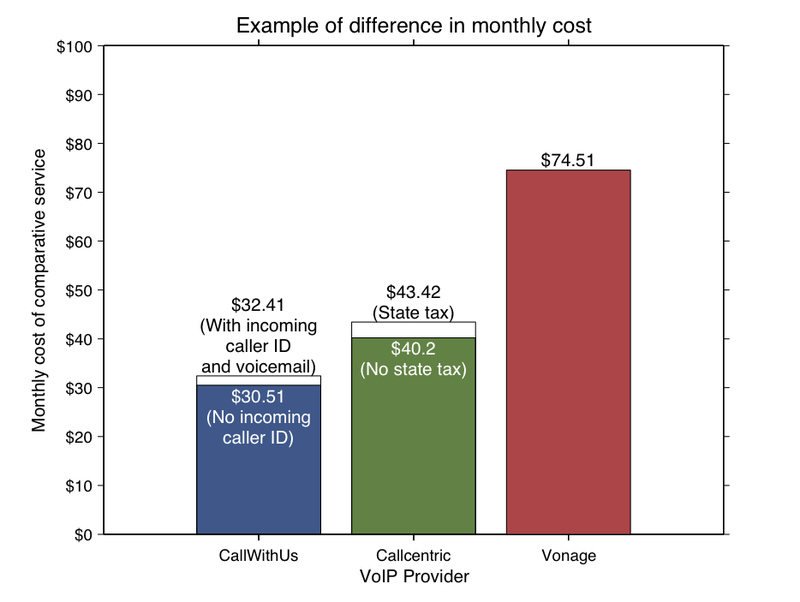 These are the prices calculated from my actual vonage calling data. 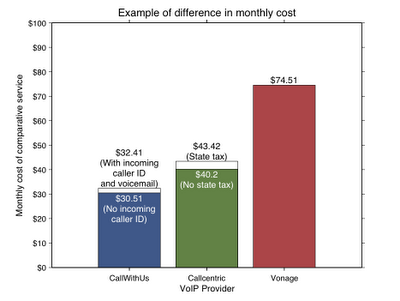 This assumes all calls are outgoing, so it is a maximum cost. I would have certainly paid less in some cases. Updated 2/20/2012 with my requirements in a VoIP provider. A good article from Appllio outlining the different plans for next generation "4G" mobile networks. Here is a brief summary in English of the main points of the article. TD-LTE, which will be used by Softbank, was originally designed only for data and will therefore be able to dynamically allocate bandwidth as needed between uplink and downlink channels. This means that if downloads are congested, needed bandwidth can be taken from the uplink channel. This provides an advantage for data over FDD-LTE that is used by the other carriers and was originally designed for both data and voice. WiMAX, available from UQ WiMAX (under KDDI), presents four main differences from LTE (from a consumer's point of view). 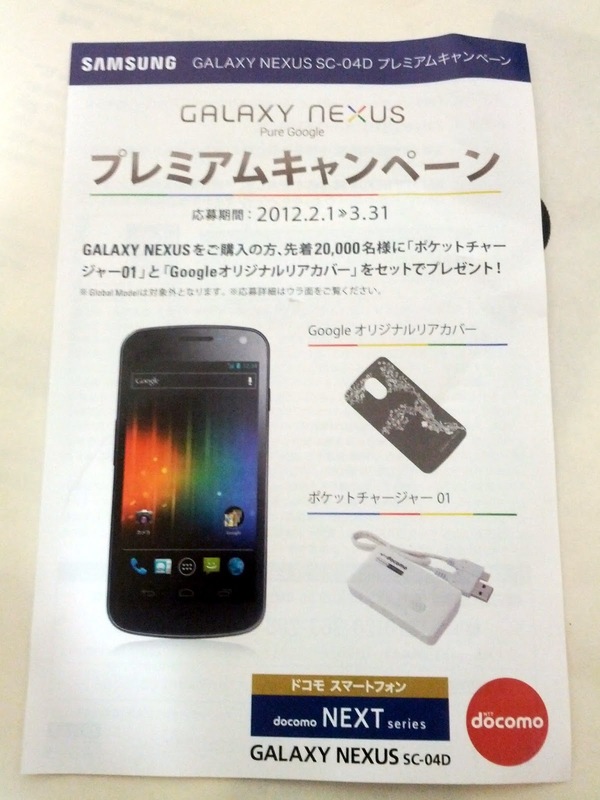 LTE data plans replace 3G plans, but Wimax is an option added to an existing 3G plan currently for and additional ¥525. WiMAX currently has no usage limits. WiMAX has a 2 year head start on Docomo Xi and has a corresponly much larger coverage area of 100 million people. WiMAX uses a higher frequency than competing LTE networks and is therefore more easily attenuated indoors/underground. Docomo Has Xi LTE currently available (I use it - but with a 3G handset) and will have 25% of the population covered by April. A year later they expect to have a total of 60%, including all major cities. By 2014, coverage is expected to be at 80% and 98% by 2015. Xi will move up to 100 Mbps around mid year. KDDI (AU) is currently offering WiMAX. They will roll out LTE from 12/2012, starting with 60% coverage of the population at 75 Mbps. By the beginning of fiscal 2015, they plan to have 96.5% coverage. Softbank 4G is currently available with an advertised maximum downlink of 110 Mbps (this is apparently not being attained, but 60 Mbps is still good). By the start of fiscal 2013, they expect to cover 99% of the population. Only routers are currently available. SBM has also announced a FDD-LTE network by mid 2012, but it is unclear if this schedule will be met because of the unfair allocation of channels by the government. 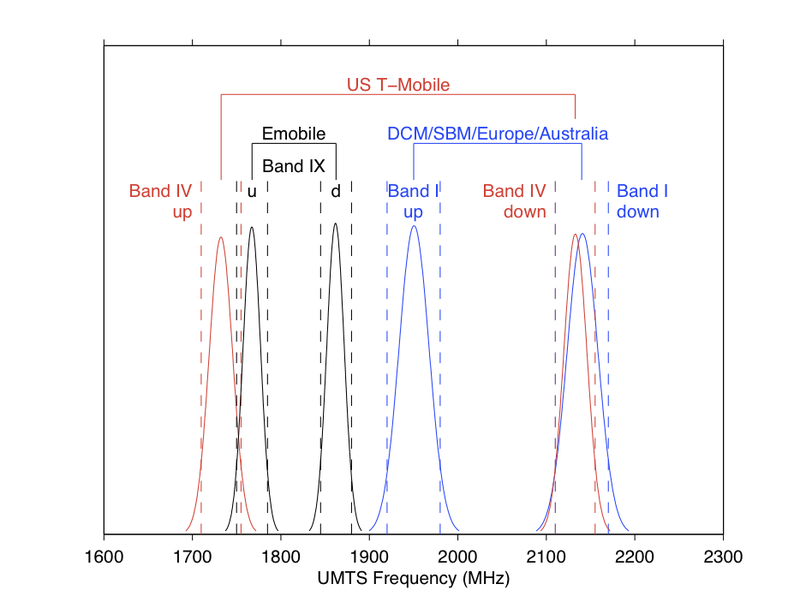 AU and Docomo enjoy two channel bands, while SBM is limited to one. This means that SBM has to totally bring down it's LTE network to build out new technology. E Access (Emobile) is starting LTE service from the start of fiscal 2012. After one year, they expect to cover 70% of the population. Urban downlink will be at 37.5 Mbps. In rural areas downlink will be 75 Mbps. If they win the 900 MHz allocation, it would likely have an effect on their LTE plans. Fixed process crash on input of a special query. Fixed process crash when keyboard switch key is pushed at the same time as other keys. Fixed the lack of persistence of conversion history. Download it from the market if you haven't already.